The Global Village brings a broad range of rights and obligations to its citizens. These include rights to safety, security, health and access to information. Obligations include protecting the environment and respecting the safety, property and privacy of others. 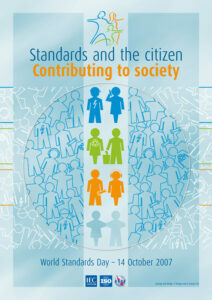 Standards help citizens to exercise these rights and obligations. They do this, for example, by providing consumers with information and protection, by ensuring the quality and safety of products and services, by defining requirements or giving guidance related to the environment and other issues important to citizens including societal equity, health, security, information and communication, and fair trade. A world without standards would soon grind to a halt. Transport and trade would seize up. The Internet would simply not function. Hundreds of thousands of systems dependent on information and communication technologies would falter or fail — from government and banking to healthcare, air traffic control, emergency services, disaster relief and even international diplomacy. So many aspects of the modern world are heavily dependent on standards. It is difficult to exaggerate the importance of standards in our everyday lives. Consider the standards involved in reading this message. If you are sitting in front of a computer screen, hundreds of standards are at work running the computer, providing Internet access, and even defining the fonts and formatting of the text itself. If you are reading this message on paper, then the paper size probably conforms to a standard simplifying the printing and distribution processes. The power source for your computer or printer, the lighting, heating or air conditioning — all, to some extent, rely on standards. Without standards, consider how difficult — or even dangerous — it would be to carry out ordinary, daily tasks. Safety standards for machinery protect us at work and at play. At home, standards keep electrical appliances connected to the national grid and keep our refrigerators and airconditioners compliant with environmental safeguards to prevent global warming. Our audio systems, television sets and DVD players, mobile phones and WiFi all comply with standards to make them compatible with other systems. From mobile videos and music to online education, telemedicine, e-banking and satellite navigation systems for our cars and aircraft — where would we be without standards in an increasingly networked world? The work of IEC, ISO and ITU in developing international standards opens up markets but also brings environmental protection, safety, security, health and access to information and knowledge. Increasingly international standards are helping to break down the barriers between rich and poor nations. Standardization helps provide higher quality at lower costs by ensuring that competition exists between vendors. It makes it easier for consumers to make an informed choice about equipment or services that they buy. International standardization has been in place for nearly 150 years. Today, with the understanding that standards can vastly expand the market for technological innovations, industry invests billions of dollars in standardization. Standards foster healthy commerce and fair prices. Global standards developed with open processes and with consensus among all stakeholders give access to global markets. As we move into the future, the work of IEC, ISO and ITU will continue to facilitate the development and diffusion of new technologies that will drive the world economy, contributing to the well being of all of the world’s inhabitants.